What is a pulmonary embolism? What does it look like (picture)? What are the signs and symptoms of pulmonary embolism? What are the causes and risk factors for pulmonary embolism? What tests diagnose pulmonary embolism? Can pulmonary embolism cause death? Can pulmonary embolism be prevented? Pulmonary embolism (PE) describes the blockage of a pulmonary artery or one of its branches by a blood clot or foreign material. Risk factors for the blood clot (thrombus) that travels to the lung (pulmonary embolism) include prolonged immobilization, medications, including birth control pills, smoking, genetic predisposition, an increased number of red blood cells (polycythemia), cancer, pregnancy, surgery, or damage to blood vessel walls. If not treated promptly, pulmonary embolism may lead to sudden death. The diagnosis of pulmonary embolism may be difficult to make, and initially may be missed. Diagnostic strategies need to be individualized to each patient and situation. Anticoagulation medication is the treatment for pulmonary embolism, and the patient may be required to continue treatment for a minimum of 3 to 6 months. Prevention is the best treatment for pulmonary embolism, which can be accomplished by minimizing the risk factors for deep vein thrombosis (DVT). The lungs are a pair of organs in the chest that are primarily responsible for the uptake of oxygen and removal of carbon dioxide from the blood. The lung is composed of clusters of small air sacs (alveoli) divided by thin, elastic walls (membranes). Capillaries, the tiniest of blood vessels, run within these membranes between the alveoli and allow blood and air to come very near to each other without actually touching. The distance between the air in the lungs and the blood in the capillaries is very small, and this allows molecules of oxygen and carbon dioxide to transfer across the membranes. The exchange of the air between the lungs and blood are through the arterial and venous system. Arteries and veins both carry and move blood throughout the body, but the process for each is very different. Arteries carry blood from the heart to the body. Veins return blood from the body to the heart. Red blood cells contain hemoglobin, a molecule that facilitates transport of oxygen and carbon dioxide within the bloodstream. Oxygen-carrying blood travels from the left side of the heart to all the tissues of the body. The oxygen attached to a red blood cell is extracted by the tissue, and carbon dioxide (a waste product) is picked up by the now empty red blood cell. The blood, now without oxygen molecules and with higher levels of carbon dioxide, is returned via the veins to the right side of the heart. The blood is then pumped out of the right side of the heart to the lungs, where the carbon dioxide is removed and oxygen, from the air that we breathe, is added to the blood. Now the blood, high in oxygen and low in carbon dioxide, is returned to the left side of the heart where the process starts all over again. The blood travels in a circle and is therefore referred to as circulation. Oxygen is carried within the red blood cell by a molecule known as hemoglobin. When this combination of oxygen and hemoglobin occurs, the oxygen-carrying blood turns brighter red. This blood oxygen saturation can be measured, either by sampling the blood from an artery or by a noninvasive device called an oximeter that can be placed on a finger or earlobe. Oxygen saturation in a healthy individual approaches 100% at sea level. If a blood clot (thrombus) forms in the one of the body's veins (deep vein thrombosis or DVT), it has the potential to break off and enter the circulatory system and travel (or embolize). It then becomes lodged in one of the branches of the pulmonary artery in the lung. A pulmonary embolus clogs the artery that provides blood supply to part of the lung. The embolus not only prevents the exchange of oxygen and carbon dioxide, but it also decreases blood supply to the lung tissue itself, potentially causing lung tissue to die (infarct). A pulmonary embolus is one of the life-threatening causes of chest pain and should always be considered when a patient presents to a healthcare provider with complaints of chest pain and shortness of breath. in some cases, tumor tissue from cancer. The signs and symptoms of a pulmonary embolus are caused by blockage of part of the arterial tree of the lung, preventing the blood's ability to reach all parts of the lung tissue. Chest pain: The pain is classically described as pleuritic, a sharp pain that worsens when taking a deep breath. Shortness of breath: The person may have difficulty catching their breath at rest, and the shortness of breath often worsens with activity. The patient may have stable vital signs (blood pressure, heart rate, respiratory rate, and oxygen saturation), but depending upon the amount of blood clot in the lung and how much lung tissue is affected, the vital signs may be abnormal. The heart rate and respiratory rate may elevate as the body tries to compensate for less oxygen transfer in the lung. Breathing and heart rate increase to help circulate the blood throughout the body more quickly, so that the available oxygen can be distributed as best as possible to the body's organs and tissues. This may lead to weakness and lightheadedness as the body's organs are deprived of the necessary oxygen to function. If the blood clot is large enough, it can block blood from exiting the right side of the heart, thus preventing blood from entering the lungs. No blood enters the left side of the heart to pump blood throughout the rest of the body. This can result in shock (circulatory collapse) and sudden death. Up to 25% of patients with pulmonary embolus may experience sudden death, in which the patient collapses, stops breathing, and their heart stops beating (cardiac arrest) without prior symptoms. Pulmonary embolus is the second leading cause of sudden death, behind coronary artery disease. Pulmonary embolus is the end result of a deep vein thrombosis or blood clot elsewhere in the body. Most commonly, the DVT begins in the leg, but they also can occur in veins within the abdominal cavity or in the arms. damage to the walls of the veins. There always needs to be a high a level of suspicion that a pulmonary embolus may be the cause of chest pain or shortness of breath. The healthcare professional will take a history of the chest pain, including its characteristics, its onset, and any associated symptoms that may direct the diagnosis to pulmonary embolism. It may include asking questions about risk factors for deep vein thrombosis. Physical examination will concentrate initially on the heart and lungs, since chest pain and shortness of breath may also be the major complaints for heart attack, pneumonia, pneumothorax (collapsed lung), dissection of an aortic aneurysm, among other conditions. In pulmonary embolism, the chest examination is often normal, but if there is some associated inflammation on the surface of the lung (the pleura), a rub may be heard (pleura inflammation may cause friction, which can be heard with a stethoscope). The surfaces of the lung and the inside of the chest wall are covered by a membrane (the pleura) that is full of nerve endings. When the pleura becomes inflamed, as can occur in pulmonary embolus, a sharp pain can result that is worsened by breathing, so-called pleurisy or pleuritic chest pain. The physical examination may include examining an extremity, looking for signs of a DVT, including warmth, redness, tenderness, and swelling. It is important to note, however, that the signs associated with deep vein thrombosis may be completely absent even in the presence of a clot. Again, risk factors for clotting must be taken into consideration when making an assessment. Being able to assess a patient and determine the risk for pulmonary embolus is very useful, since many patients have chest pain and shortness of breath when seen in an emergency department, urgent care facility, or their health care professional's office or clinic. If the answer is yes to any of these questions, then the diagnosis of pulmonary embolus still needs to be considered. The chest X-ray is often normal in pulmonary embolism. The EKG may be usually normal, but may demonstrate a rapid heart rate, a sinus tachycardia (heart rate > 100 bpm). If there is significant blockage in a pulmonary artery, it acts like a dam and it is harder for the right side of the heart to push blood past the obstructing clot or clots. The EKG can demonstrate right heart muscle strain. Since the risk of missing the diagnosis of pulmonary embolus can include death, the healthcare professional has to consider this diagnosis when caring for any patient complaining of chest pain or shortness of breath. In the past, the gold standard for the diagnosis of pulmonary embolus was a pulmonary angiogram, where a catheter was threaded into the pulmonary arteries, usually from veins in the leg. Dye was injected and a clot or clots could be identified on imaging studies. This is considered an invasive test and is now rarely performed. Fortunately, there are other, less invasive ways to make the diagnosis. The decision as to which test might best make the diagnosis needs to be individualized to the patient and their presentation and situation. If the healthcare professional's suspicion for pulmonary embolism is low, a d-Dimer blood test can be used for reassurance that a blood clot may not be present. The d-Dimer blood test measures one of the breakdown products of a blood clot. If this test is normal, then the likelihood of a pulmonary embolism is very low. Unfortunately, this test is not specific for blood clots in the lung. It can be positive for a variety of reasons including pregnancy, injury, recent surgery, cancer, or infection. D-dimer is not helpful if the potential risk for a blood clot is high. If there is greater suspicion, then computerized tomography (CT scan) of the chest with angiography can be done. Contrast material (dye) is injected into an intravenous line in the arm while the CT is being taken, and the pulmonary arteries can be visualized. There are some limitations of the test, especially if a pulmonary embolism involves the smaller arteries in the lung. However, similar problems are seen with the more invasive pulmonary angiogram. As CT scan has become more and more sophisticated, not identifying significant emboli is very unusual. It is very important that the contrast material used during the CT angiogram be timed appropriately so that the bolus of dye is not diluted as it travels through the lungs. There are some risks with this test since a patient may be allergic to the contrast material, and the contrast material may damage kidney function, especially if the patient's baseline kidney function (as measured by a creatinine blood test) is abnormal. It may be wise to limit the patient's exposure to radiation, especially in pregnant patients. However, since pulmonary embolus can be fatal, even in pregnancy this test can be performed, preferably after the first trimester. Ventilation-perfusion scans (VQ scans) use radioactive labeled molecules (often xenon gas, and albumin protein). Gas is inhaled and the low-level radiation is detected throughout the lung fields in the distribution of the pulmonary airways (ventilation). This radioactivity is referred to as gamma radiation and is similar in intensity to sun light rays. The duration of this radioactivity is often measured in hours. Radiolabeled albumin is also injected and the lungs are scanned where these molecules are trapped in the lung following the pulmonary arterial blood path (perfusion). The radiologist then compares multiple different views of perfusion and ventilation looking for areas that are not identical. If blood flow is lacking to a portion of lung often a pie shaped wedge defect is seen, ventilation to this area is usually preserved. This is referred to as a ventilation perfusion mismatch. If a mismatch occurs, meaning that there is lung tissue that has good air entry but no blood flow, it may be indicative of a pulmonary embolus. These tests are read by a radiologist as having a low, moderate, or high probability of having a pulmonary embolism. There are limitations to the test, since there may be a 5%-10% risk that a pulmonary embolism exists even with a low probability V/Q result. Ventilation-perfusion scans (VQ scans) use labeled chemicals to identify inhaled air into the lungs and match it with blood flow in the arteries. If a mismatch occurs, meaning that there is lung tissue that has good air entry but no blood flow, it may be indicative of a pulmonary embolus. These tests are read by a radiologist as having a low, moderate, or high probability of having a pulmonary embolism. There are limitations to the test, since there may be a 5% to 10% risk that a pulmonary embolism exists even with a low probability V/Q result. Ultrasound of the legs, also known as venous Doppler studies, may be used to look for blood clots in the legs of a patient suspected of having a pulmonary embolus. If a deep vein thrombosis exists, it can be inferred that chest pain and shortness of breath may be due to a pulmonary embolism. The treatment for deep vein thrombosis and pulmonary embolus is generally the same. Echocardiography or ultrasound of the heart may be helpful if it shows that there is strain on the right side of the heart. If non-invasive tests are negative and the healthcare provider still has significant concerns, then the healthcare professional and the patient need to discuss the benefits and risks of treatment versus invasive testing like angiography. The best treatment for a pulmonary embolus is prevention. Minimizing the risk of deep vein thrombosis is key in preventing a potentially fatal illness. The initial decision is whether the patient requires hospitalization. Recent studies suggest that those patients with a small pulmonary embolus, who are hemodynamically stable (normal vital signs) and who can be compliant with treatment, may be treated at home with close outpatient follow-up. Patients who are stable have normal vital signs and show no evidence of right heart strain on blood tests, EKG and CT. Patients with abnormal or unstable vital signs need to be admitted to the hospital for treatment. Those who have difficulty understanding or administering their medications, have unstable social situations may also need to be observed. Anticoagulation prevents further growth of the blood clot, preventing more lung tissue from being affected. The body has complex mechanism to form blood clots to help repair blood vessel damage. Under normal conditions, there is a clotting cascade with numerous blood factors that have to be activated for a clot to form. Under normal conditions, the body also will activate the system that breaks down clots often completed over a 4 to 6 week period. 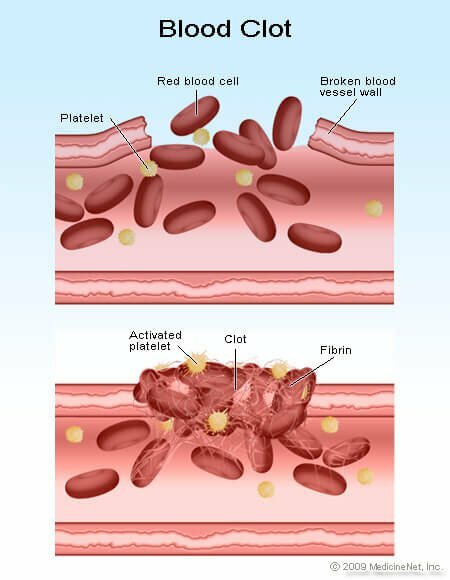 There is a careful balance between the clotting system and the system that breaks down a clot. This system is essential to help us handle bleeding injuries. When bleeding occurs, say from trauma, or a cut, this activates the clotting system to prevent major loss of blood. Medications are available that block the clotting cascade at different places and therefore "thin" or anti-coagulate the blood. Warfarin (Coumadin) is the classic anti-coagulation medication that acts as a Vitamin K antagonist, blocking blood-clotting factors II, VII, IX and X. It is prescribed immediately after diagnosis of a clot or pulmonary embolism, but unfortunately may it take many days for the blood to be appropriately thinned. Therefore, subcutaneous low molecular weight heparin (enoxaparin [Lovenox]), fondaparinux (Arixtra), or regular IV heparin is administered immediately and at the same time as coumadin. It thins the blood via a different mechanism and is used as a bridge therapy until the warfarin has reached its therapeutic level. Enoxaparin injections can be given on an outpatient basis. For those patients who have contraindications to the use of enoxaparin (for example, kidney failure does not allow enoxaparin to be appropriately metabolized), intravenous heparin may be used as the first step in association with warfarin. This requires admission to the hospital. The dosage of warfarin is monitored by blood tests measuring the prothrombin time or INR (international normalized ratio). This is essentially the ratio of the patients clotting ability compared with a normal lab standard. This INR ration allows standardization of testing so that values from different labs can be compared. Therapeutic levels range from 2.0 to 3.0, that is two to three times normal values. These medications do not need blood tests to monitor dosing. The decision to prescribe a type of anticoagulation medication (Vitamin K antagonist v. Factor Xa inhibitor v. thrombin inhibitor) depends upon the patient situation. Patients who take any of these medications are at risk for bleeding. At present, there is no antidote approved in the United States to reverse the effects of the Factor Xa. The recommended length of treatment for a pulmonary embolism is determined by the knowledge of precipitating causes of the clot. For example, if a patient has leg trauma or surgery and develops a DVT and PE, than treatment can be for a shorter duration, approximately three months. However, if the cause is unknown or uncertain, or relates to intrinsic defect in clotting function, the duration may be a year or more. A study, reviewed this issue and found a small but real risk of recurrent clot in individuals that had PE for no apparent reason. This study suggested the use of apixaban for an additional year following completion of Coumadin therapy. damage to other organs including the heart and kidneys. tPA helps break up or dissolve the arterial clot. It may be given peripherally in an IV or centrally, through a catheter that is inserted in the arm or groin and threaded into the pulmonary artery, so that the medication can be delivered directly to the clot. Evidence of right heart strain on CT scan or by echocardiogram, or blood tests that show the heart to be under strain (for example, troponin levels), also may be an indication for thrombolytic therapy, depending upon the clinical situation. Thrombolytic therapy with tPA is an emergent treatment that thins the blood immediately. Warfarin and factor X inhibitors are not prescribed immediately in this situation, though unfractionated heparin may be used initially while decisions regarding the use of tPA are considered. the ability for a diagnosis to be made and treatment initiated. The diagnosis is often difficult, and it is estimated to that there are up to 400,000 cases of pulmonary embolus that are not diagnosed in the United States each year. In those patients where the diagnosis is made, the death (mortality) rate is less than 20% when considering all patients. Usually, however, the mortality risk is much less in most patients. The higher incidence of death occurs in patients that are older, have other underlying illnesses, or have a delay in diagnosis. Racial differences may also exist, but probably are due more to access to quality care than a specific genetic difference. Minimizing the risk of deep vein thrombosis minimizes the risk of pulmonary embolism. The embolism cannot occur without the initial DVT. In the hospital setting, the nursing staff works hard to minimize the potential for clot formation in immobilized patients. Compression stockings are routinely used. Surgery patients are out of bed walking (ambulatory) earlier and low dose heparin or enoxaparin is being used for deep vein thrombosis prophylaxis (measures taken to prevent deep vein thrombosis). For those who travel, it is recommended that they get up and walk every couple of hours during a long trip. Compression stockings may be helpful in preventing future deep vein thrombus formation in patients with a previous history of a clot. Smoking is a risk factor for DVT formation, especially in women who are on the birth control pill. Antithrombotic Therapy and Prevention of Thrombosis, 9th ed: American College of Chest Physicians Evidence-Based Clinical Practice Guidelines. Chest. 2012;141(2_suppl):e737S-e801S. doi:10.1378/chest.11-2308. Giancarlo, A., et al. "Apixaban for Extended Treatment of Venous Thromboembolism." New England Journal of Medicine. 368 (2013): 699-708. Kline, JA et al. Prospective multicenter evaluation of the pulmonary embolus rule-out criteria. J Thromb Haemost. 2008 May, 6(5). Pollack, C.V., et al. "Idarucizumab for Dabigatran Reversal." New England Journal of Medicine. 373.6 (2015): 511-520.